I'm back to worrying again at the structural design of a house to fit into the natural hollow in the north-east corner of my croft, a house to fit organically into the landscape. It isn't that I've fallen out of love with the Winter Palace, I haven't. I like it very much. So long as I remain single, and remain fit enough to climb its stairs, it suits me very well. But it is my ambition some day to cease to be single, and within the next twenty years the stairs will probably become beyond me. So in the long term another house is necessary. And the view from this house is very restricted; from the hollow in the north east corner I could see out to the Isle of Man. So let's go over the options for that hollow. The first option I designed was the design I called Sousterran: four tessellated concrete domes, supported by beautifully sculptural flying buttresses. The merits of that design remain that its irregular, sculptural shape would fit very well into the landscape, that it is iconic and would be beautiful; and, in so much as the design is modular, extending it would actually be easy. The demerit is that it uses a lot of concrete, a lot of embodied energy. An eco-house it is not. A further technical problem is that if the waterproofing of the back wall were to fail, it would be extremely expensive and difficult to fix. 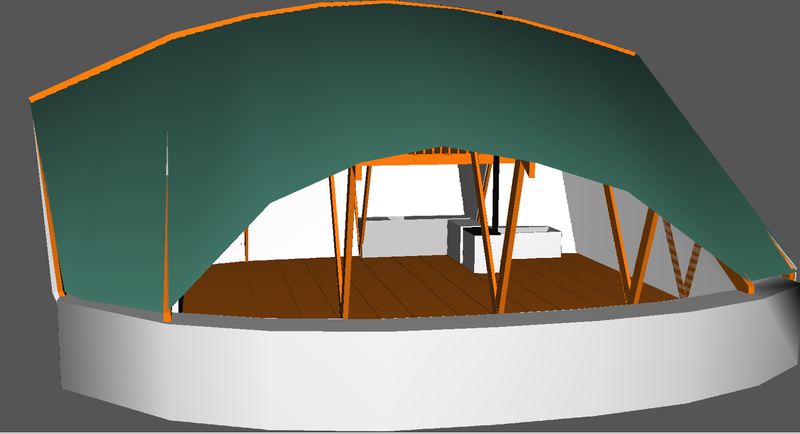 So the next design was the design I called Singlespace: a mostly-timber conical roof over a single large, circular room, later (in the Longeaves variant) with some sheltered external storage and the possibility at a later stage of adding an earth closet attached to the building, which one could use without going out of doors. Again, the design is elegant. But for me the major demerit is that the regular cone, even if turf-roofed, would look significantly unnatural. It would draw the eye in the landscape, immediately announcing something artificial. Also, if the back wall were not to suffer the same waterproofing issues as with Sousterran, there would have to be a significant walkway round the back, which firstly wastes space and secondly interrupts the continuity of the walking surface between the natural hillside and the roof. There would be, in effect, a chasm to be stepped over, or fallen into. It was in thinking about that gap that I came up with the new design. The issue about the gap is that, if the earth of the hillside presses directly against the back wall of the house, that wall has to be very efficiently waterproofed - 'tanked' - to prevent damp. That's complex in itself, but it it fails, a great deal of earth has to be very carefully removed to expose the wall for repair, which would be expensive. Also, the wall needs to be inherently strong enough to resist the thrust of the hillside - not a problem with the hexagonal concrete cells of Sousterran, but much more problematic with a lighter weight wooden or straw structure. If the wall is vertical. If the wall is vertical? Of course a wall is vertical. Yes, but what if it isn't? If it isn't, if it lies back parallel to the slope, you still get an air gap behind the house, eliminating the penetrating damp problem. And you can still - if rather less comfortably - get in to do any necessary maintenance. But you save that wasted space, you get more volume inside, and you close up the chasm between the hillside and the roof. Good! Of course, you could have an angled back wall with the conical Singlespace roof, using a yurt like structure. 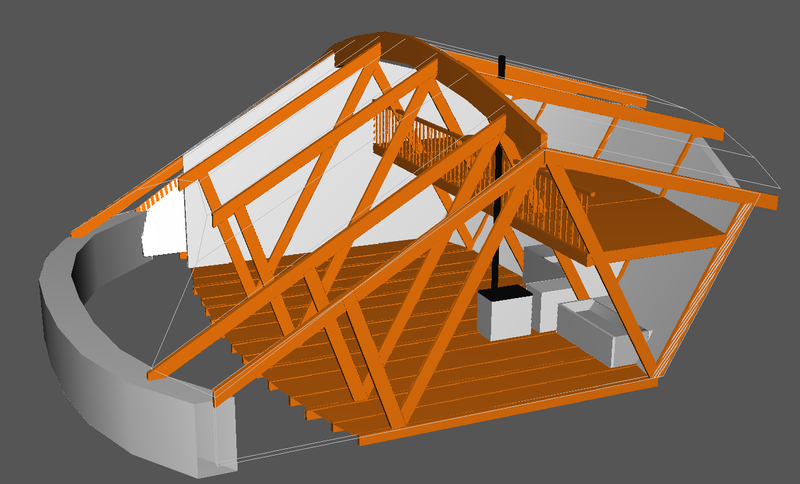 But in thinking about how you support an angled-out back wall, I thought of a W shaped cantilever truss. However, if you have a triangular truss supporting a principal rafter from a point which is fairly central under that rafter, there should be no significant thrust on the roof tree. So the trusses supporting principal rafters on the back and front sheds of the roof don't need to line up with one another. So I came up with a sketch in which the trusses are staggered, and that's actually rather interesting in terms of the interior space. The space is continuous, and you can walk through it, but the trusses naturally break the space up into smaller spaces with a degree of visual privacy. Of course, the staggered trusses could be built symmetrically to a straight rooftree supporting rectangular plane roof sheds. But actually they need not. A curved roof tree supporting sheds with simple, not compound, curvature would fit much more naturally into the landscape. 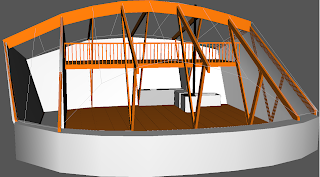 I think this could be reasonably simple and easy to build - but of course the roof tree and purlins would need to be laminated, which is a little more complex than simply straight beams. This design is at a fairly early stage. It has three times the space of the Winter Palace upstairs, but only about twice the space downstairs (and the need for a staircase limits the amount of usable room upstairs). Obviously, of course the basic design could be significantly bigger, either by increasing the span of the trusses or by adding an extra bay (or two bays) to the right hand end. There are some details which are not yet worked out. I've shown storage space (for e.g. firewood, or sheddy things) at the left-hand end of the building, but I have not yet thought through the right hand end. I also haven't decided what to do about a staircase. In order to get two reasonably private bedrooms upstairs, the staircase needs to go up the middle of the building. It could go up the sloping back wall, at the left hand end of the sink unit in these drawings; or it could go across the middle of the space, dividing off the kitchen; although that would be a bit wasteful.